One of the reasons why I was intrigued by this press release was because I suspect that some might initially find these badges trivial. People always point to "attendance badges" as a one of the reasons that many employers and universities have yet to take digital micro-credential serious. I have been ranting about such "carpetbadging" for some time because it leads them to dismiss the value of other badges. But I was pretty sure that the folks at Credly would help Simone figure out how to get the necessary evidence into the Certified Airbrush Tanning Technician badge. That in turn might let me drive home the point that badges in and of themselves are largely meaningless. Rather, it is the claims and evidence that the badges displaythe evidence that the badges link to, and the way this information takes on meaning as it gets stretched across issuers, earners, educators, and viewers. Training is actually really important in our industry. There currently are no regulations and people can learn it on their own or from somebody whose real goal is selling equipment and projects. There are actually six different primary skin types, and people need to get expert instruction and practice matching solutions to skin type if they want to be certain they never turn anyone orange. Then the need to get hands-on instruction with the spray techniques themselves so they know they can do it correctly starting with their very first client. 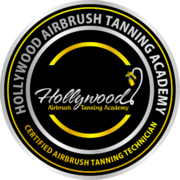 The holder of this badge completed the hands-on Airbrush Tanning Course and is a certified Airbrush Tanning Technician with the Hollywood Airbrush Tanning Academy. The holder of this badge has learned the advanced Hollywood spray tanning technique and knows how to match spray tanning solution to different skin types, how to spray tan with an HVLP system/spray gun, and has spray tanned 3-4 models. If you were a potential customer, you might learn that solutions need to be matched to different skin types and that some potential tanners were trained by vendors--making for a more informed consumers. If you were a stylist for one of the celebrity clients like those who go to Simone's own studio, you might want evidence of more experience and expertise. If you were a satisfied customer, you might you might follow the links to learn about the academy and take the class yourself and try to break into the business. If you were looking for somebody in your town to offer this service or an somebody to freelance in your salon, you might find someone at the Credly site. It is worth noting that the evidence link in each of the badges simply links to a picture of the earner smiling holding the traditional certificate that they earned. Of course, in many badges this link goes back to addition evidence supporting those claims. For example, the Credly badge that I earned for doing a virtual presentation at the EDUCAUSE annual meeting includes extensive details about the conference along with an evidence link back to a recording of the actual webinar that I presented and the slides from my talk. Certainly Simone might have include more information, such as the level expertise the training demonstrated at the end of their training. But that would have been overkill. And that brings me to the point of this post. This example that some might initially find trivial actually nicely illustrates how digital badges allow issuers to adapt the rigor or their credentials to the context, and how this information can then circulate in social networks that allows web-enabled information about education and competencies to circulate in professional networks. That allows this information to both take on new meaning and create new meaning.